Captains and Crew Wanted! Take charge of your destiny and gain valuable Skills for the future! Pilots – Gunners – Engineers – All needed for cargo transit and airspace defense! Explore strange lands! Capture valuable resources! Travel the world and defeat pirate scum! It’s not an easy life, but there’s nothing else like it. Plenty of folks like yourself have decided to slip the surly bonds of earth and take to the skies after hearing tales of bold Captains, fearless Gunners, and cunning Engineers and their high-flying exploits. Think you have what it takes to join their ranks? 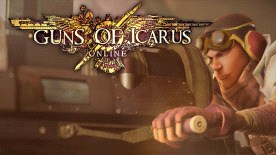 Raising the stakes on team-based PvP combat with an emphasis on strategic competition and truly cooperative play, Guns of Icarus Online is the premier airship combat game that’s all about teamwork, tactics, and fast-paced action. With a good ship and the right crew, you can conquer the skies!